Formerly called Simhapura (Lion Citadel), Tra Kieu was the first capital of Champa and remained so from the 4th century to the 8th century. Today nothing remains of the ancient city except the rectangular ramparts. 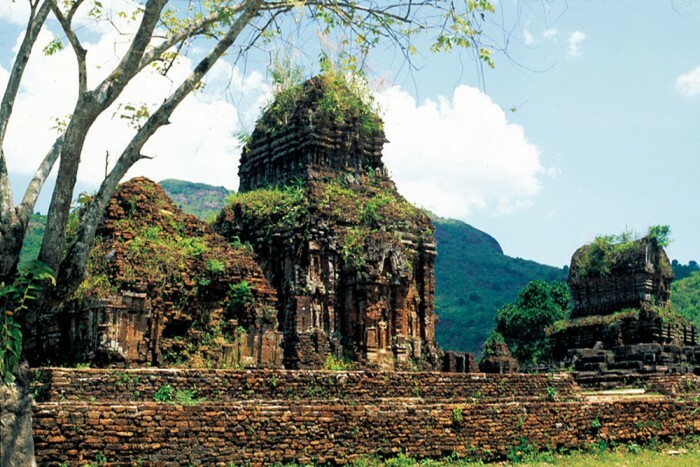 A large number of artefacts, including some of the finest carvings in the Museum of Cham Sculpture in Danang, were found here. Atop Buu Chau Hill is the modern Mountain Church (Nha Tho Nui), built in 1970 to replace an earlier structure destroyed by an American bomb. It offers wonderful views. The church is about 200m from the morning market (Cho Tra Kieu). The 19th-century Tra Kieu Church (Dia So Tra Kieu) is home to a museum (Van Hoa Cham) of Cham artefacts, collected by local people and then amassed by a priest. The artefacts are kept in a locked, dusty room on the 2nd floor of the building to the right of the church. According to local belief this church was the site of a miracle in 1885. Catholic villagers, under attack by anti-French forces, saw a vision of a lady in white, believed to be Mary, whom they credit with protecting them from intense shelling. To get here, follow the signs from the Mountain Church. Tra Kieu is 6.5km from Hwy 1 and 19.5km from My Son. Some day trips to My Son from Hoi An include a stop-off at Tra Kieu.